Modern conspirators can use as little as your registration, perish forbid a laptop, to steal your identity, thus playing havoc with your life and financial status for years. The consequences of a stolen weapon can be even more devastating – even when registered. If that weapon is used in the commission of a felony, who are the police going to come looking for – you or the real felon? In today’s world it makes sense to keep your documents, valuables and firearms secure and a Vegas based company called Console Vault has devised a solution for owners of Toyota Trucks and other vehicles as well. 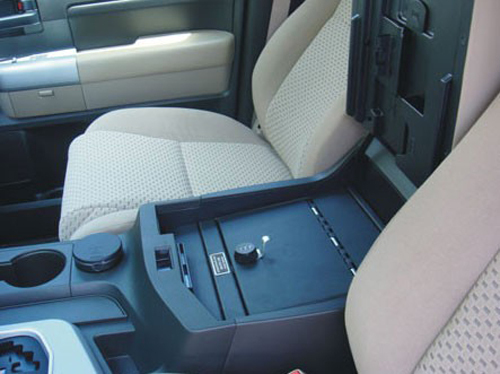 The Vehicle Vault fits securely into the space of the console, providing secure safe-keeping for anything valuable you need to leave in the truck. The President of the firm, Tom Duengel, is a proud owner of a Toyota Tacoma himself, and created the Vehicle Vault to fulfill a personal need. Since it fills a niche in his life, he wisely assumed it might fulfill a need for others. Namely, the simple and understandable need to safely protect personal belongings from car theft. "The statistics are certainly alarming," said Duengel, "with over one in three cars broken into each year. Seeing the need to protect one’s belongings – especially firearms – we set out to create a product to do just that." Notably, we think Duengel is greatly overstating the incidence of auto break-ins, but could find no authoritative accounting of the problem. In England, 2 million cars are broken into annually, according to ASK.com. However there are over 32 million cars in the UK so that’s only one in 16 per year. Millions of Americans have concealed carry permits and occasionally end up places they cannot carry the gun – consequently a safe place to store it is needed while the weapon is stored. We have no idea how many Tundra and Tacoma owners have such permits – we simply recognize this is an idea whose time has come. The Tacoma Vault fits models from 2005 to 2013 and the company has created models for the Toyota Tundra and many other Toyota models. All vehicle vaults are made in the USA and feature a range of locking options, including keys and digital codes. The firm has similar products for owners of Cadillac, Chevy, Dodge, Ford, GMC, Hummer, Jeep, Lincoln and Nissan vehicles as well. Though a firearms enthusiast, Duengel is also a passionate proponent of the responsible care of firearm storage and security. If a car containing a firearm is broken into, the consequences could be fatal, Duengel stated. "For law enforcement officials and any other owner of a firearm, all steps should be taken to ensure that firearm does not fall into the wrong hands," he concluded. To that sentiment all we can add is Amen, brother.